Thanks to all who emailed/tweeted alerts. 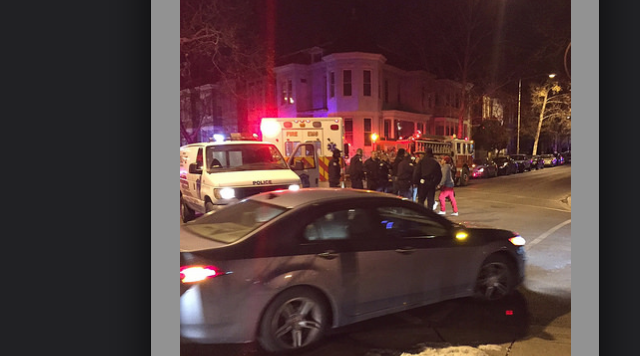 “On Saturday, January 10, 2015, around 9:40 pm the victim was shot while in the 3400 block of Holmead Place, NW. He was transported to Medstar by DC FEMS but efforts to save his life failed and he was pronounced dead. Detectives of the Homicide Branch are investigating. The next of kin of the decedent has not been notified at this time. The area will be held by police until a daylight canvass for evidence can be conducted. “Detectives from the Metropolitan Police Department’s Homicide Branch are investigating a homicide which occurred in the 3400 block of Holmead Place, Northwest. On Saturday, January 10, 2015, at approximately 9:40 pm, members of the Fourth District responded to investigate the sound of gunshots reported in the area of 14th and Monroe Streets, NW. Upon arrival in the area, the officers were directed to the 3400 block of Holmead Place, NW, where they located an adult male suffering from apparent gunshot wounds. DC Fire and Emergency Medical Services personnel transported the victim to a local hospital where he succumbed to his injuries and was pronounced dead. The victim has been identified as 21-year-old Eduardo Carias-Martinez, of Hyattsville, Maryland. Investigation into the incident continues. Suspect information is not available at this time.